Brandon and Kenny Bernstein have spent 30 years with same sponsor. It was announced in March that at the end of this year, Bernstein and the company which had sponsored him as a driver – and his father before him – Budweiser, would split up. 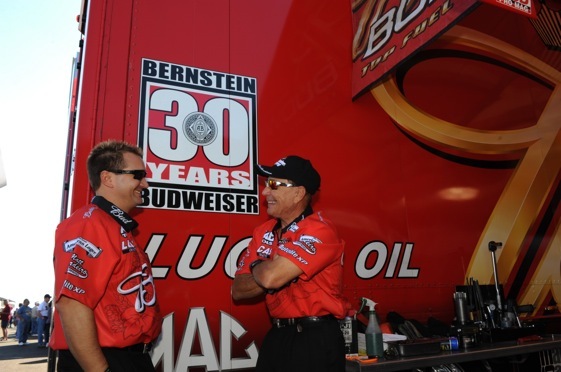 That meant this year’s trip to Gateway, which is located just across the Mississippi River from St. Louis – the hometown of Budweiser – would be the last with the signature beer company’s logo on the side of his bright-red Top Fuel dragster. The list of things which separate racing and stick-and-ball sports is lengthy. Somewhere near the top of that list is corporate sponsorship of teams, cars and drivers. Outsiders don’t understand the bond between sponsor and team. They even take some joy in ridiculing it. Not insiders. They come to identify people, places and things with the logos which are decaled to the sides of cars in motor sports. They remember Petty blue and the red STP logo, Dale Earnhardt Sr. and the black Goodwrench decals and Kenny Bernstein Racing and Bud. Few in the sport apologize for the closeness of teams and sponsors in racing. The Bernstein-Bud bond was the longest running in all of auto racing. Three decades. It is a couple years longer than was the Petty-STP partnership. It began when Bud sponsored Kenny Bernstein. Bernstein’s teams captured six NHRA titles, including four consecutive Funny Car crowns (1985-1988) and two Top Fuel titles (1996, 2001). Kenny and son Brandon, who took over as driver from his father in 2002, amassed 85 national event victories under the Budweiser flag and in 1992, Kenny became the first driver to surpass the 300 mile-per-hour barrier. So arriving in St. Louis two weeks ago, the team had a little bit more incentive than their competition. Bernstein came up just short of the victory. He finished second after being being in the final round of eliminations by Antron Brown. But while Kenny Bernstein Racing could not leave St. Louis with a victory, there is reason to believe it may leave Pomona in the fall with a Top Fuel championship. While the team has not yet won an event in ’09, it has reached the finals three times. In addition to that, the team has two other final-four showings. Bernstein arrives at Bristol Dragway this weekend for the Thunder Valley Nationals third in points _ 44 behind leader Brown and 26 behind second-place defending champion Tony Schumacher. Soon as in this weekend at Bristol? Could be. Bernstein is a two-Wally guy at Bristol. His last victory there came in 2007. He was top qualifier there in ’03 and ’05. Bernstein says that when that first victory does come, whether it be this race or the next or the next, look out. A championship this year would mean more than in other years for the team for two reasons; it was send Bud out with championship, and it could help KBR start up a whole new team-sponsor bond because right now, nobody has been signed to take over as primary sponsor for 2010. And as hard as it is to break up with Bud, it will be sweet to find somebody new.